Hard Ops 0084 can only be used with Blender 2.78 and above. There is also new WIP documentation. I also made an art dump of all the stuff I made using Hops8. Hard Ops 8 has been the longest release of the series and continues even now as we use this number to focus on enhancement and stability. 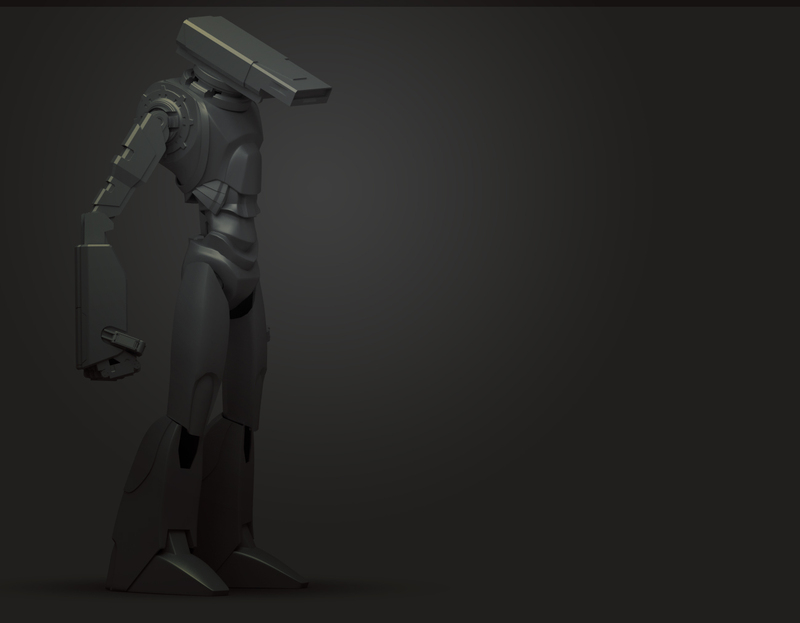 As Blender 2.78 gets closer we also try to refine this version for public consumption. With some internal changes glitches can be expected but we are working to resolve them. Currently it is still in testing stage and is the top file of the Gumroad at this moment. As issues are being reported and resolved and 2.78 comes closer it will be on the BM as well but once 2.78 is out. Kudos To MACHINƎ for allowing his drone to be the ad for this version. He is also selling it as an asset. I recommend giving it a study if you’re interested. A series of additional menus and panels have been added. The center and foundation of Hard Ops has always been the Q menu. In time I am sure we will no longer need the shift + Q hotkey and the pie and menu will toggle from the Q hotkey. Sculpt Mode now has a Q menu. In it’s current form it also has the view port menu attached which means if you choose matcaps as the option that matcaps will appear as an additional box. In fact in the Q menu if you go into Settings >> Viewport the same functionality also exists. Alt + V also brings up a viewport menu in object mode. This was just an experimental feature that was added that grew on me as I used it more and more. Cameras also have a Q menu. With handy options. Lattices also have a Q menu. My favorite is simplify.I use it to reset lattices to their simplest points and start over with deforming. Alt + M brings up a menu of all the materials in your scene for fast assignment. This is for object mode of course since edit mode would merge geometry. This is also experimental but has proven useful recently. In preferences there are additional properties for the HUD and how long it displays. That way you can adjust this to your liking. Merge has also been updated a bit. While it is still being worked on we examined the naming and decided it was best the way it was. When you select an AP and the mesh to merge with you have 2 options. Soft Merge – merges with mesh while keeping it live. This allows for tweaking then for completion just select the main mesh and choose Q >> Csharpen. Complex Merge – merge and is done. Places the OB. Deletes the BB and the AP. This is the option I would normally use. So it’s just Cmerge and Smerge. In addition to this the inserts are being expanded with new ones for users to have fun with. Mirror Mirror now mirrors across any object not just meshes. This is similar to the original mirror mirror and was a mistake on my part. This is useful because sometimes I mirror across an empty. As a recap mirror mirror has been internalized into HardOps so the plugin is no longer needed. Settings menu is a little cleaner. We discuss all the features often and what can be removed / enhanced / etc. All the remaining functions are near and dear to me even if the other teamsters don’t even use them. CSplit / CSlice now behaves better. If a mesh isn’t beveled you can slice and it will respect that. This has also carried over into box cutter and it’s behavior with unbevelled meshes. This can be handy for using the Cslice as a more utility function for alternate workflows. I like the fact that you can also use the status reset and then have cuts ignored by bevels. Q >> Meshtools >> Sstatus Reset is quite a useful option when used correctly. I am unable to explain all cases in which you would want to reset your mesh to dupe the system but it has come in handy on more than one occasion. As this post has gone on I am keeping the best for the later part. Now that the boring stuff is out of the way we can go over some of the larger changes. The T panel has underwent changes again. This was done for stability and ease of use. There is also a learning tab added for new users. On a technical level this has made things more stable and it has a connection with the other menu systems with make it easier on us internally. XUnwrap now behaves on multiple objects at once. I tend to manually unwrap hero items but for secondary stuff or quickies XUnwrap can be useful for quickly getting a mesh out to Substance Painter or a game engine. As you can see through the uv preview that both pieces are placed uniquely on the same UV space. 2d Bevel was an idea based off of the mesh cleaner for bevelling 2d shapes. I must add… DO NOT USE ON 3d SHAPES . If you do that the results will be different. I must also stress the importance of modifier stack order as well with using this since it can have issues. I consider this an experimental feature. In this example I used 2d bevel then Tthick to add thickness on top of the bevelling of the 2d shape. All it does it round corners using a limited dissolved mesh with a bevel set to only verts. CleanMesh(E) is also a new feature that has been added. This will do a limited dissolve / remove doubles operation on the mesh. I cannot stress that this is for planar-ish meshes and will not give good results where linework is specific. Also make sure you check pro mode under preferences to enable it. Since it is an experimental option. Clean mesh will dissolve all useless edges. This can be useful for simplifying meshes for boolean operations. This is something I think it’s best to experiment with and try out. It can be useful having useless edges dissolved when it comes to simplification. These two videos have portions where I am experimenting with the simplification of the CleanMesh(E). Sometimes this can also make booleans easier to perform due to there being less errors. If you are using guidance loops for control then you may not want to use this on the main mesh but like I said use it at your own peril. So with that I conclude this post and have fun operatives! Big shoutout to AR. He’s been down since the beginning and continues to be a big part in the shadows. He also rendered the apartment ad for HardOps. Moth3r created the gun image which also was an Hard Ops ad. As always it’s the operatives that keep this tool alive and kicking. I cannot stress how important it is to experiment with the tool and find a unique way of your own for using the tool. I often find people using it in strange and unique ways that get results far beyond even my expectations. 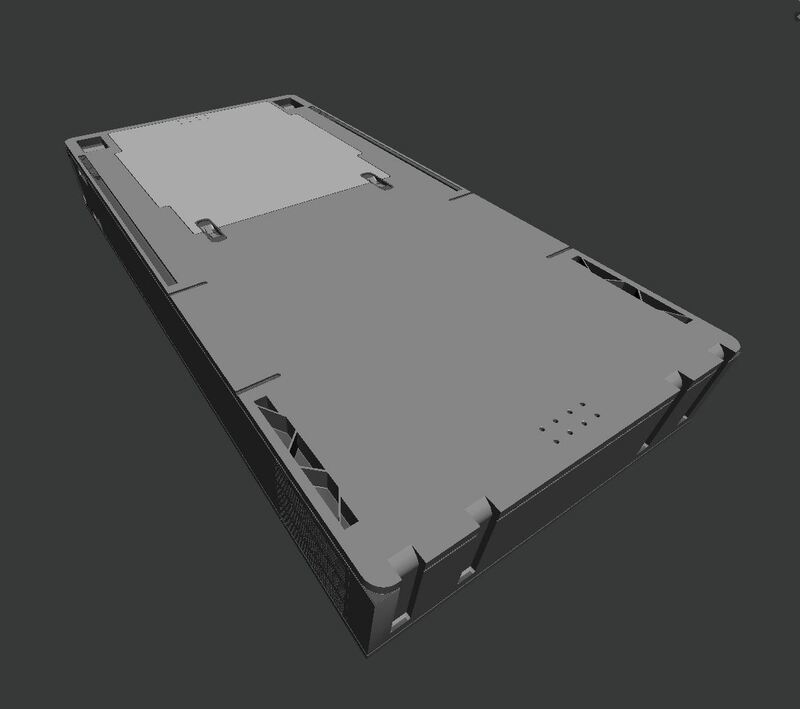 Alot of the features I feel extend past hard surface modelling and are just the way I wish some things behave. 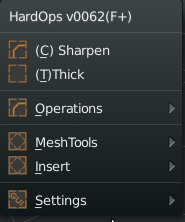 It’s a understandable impression that Hard Ops is primarily a hard surface toolkit but it’s also a workflow assistant. The WIP manual is always being updated. I will begin making it the final documentation for hard ops so please check on it occasionally for additional information on how to use the tool. Inspired by Machin3 and his tips on Hard Ops I was inspired to make some drones! So get to work operatives! Box Cutter 4.5 coming soon! Hard Ops was featured in 3dArtist Magazine Issue #99! Legacy Hard Ops users will of course receive a discount. Box Cutter is a brother of Hard Ops and a standalone product. IF YOU HAVE THE RED BOX DEMO ONLY THE RED BOX IS AVAILABLE. To start it press alt + w. To draw a sub box press ctrl + left click and drag. It requires a selection otherwise it uses the selection lasso. BoxCutter is a secondary project focusing on cutting with a different perspective than the toolset we all know as Hard Ops. They are intended to be used together however separately they still work albeit behave differently. Starting box cutter after enabling the add on is under the hard ops T panel. The t-panel is worth looking into. This step is important since it allows the sharpening to happen after cutting. The beveling and sharping helps in differentiating the shapes easier when they are the same color. 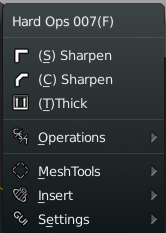 Also Hard Ops received a last minute update to support box cutter in the Q menu under mesh tools in object mode. The last one isn’t necessary however it’s there for additional functionality. The hotkey at the moment is Alt + W.
In total theres 3 ways to start box cutting. That is as easy as we can make it. Now for the complicated stuff but very fun stuff. Firstly when you are in box cutter the screen has indicators. This is important. Very very important. The box on the right is AR’s idea of indicating Box Cutter mode. I wanted it red but haha its grey. On the left is the Cutter indicator. This is something you want to be aware of. So basically in Object mode you can use D to change cutter mode. And cancel with escape. You want to cancel when you aren’t using it since we currently are still dealing with it. You can open multiple box cutters on top of each other by accident. Which is unexpected and unwanted behavior. So now lets get cutting! Holding down ctrl allows for you do cut out a shape in a box that you draw. However this has a modifier to it as well. Holding alt while drawing makes it cut to the depth level of the 3d cursor! This is quite an interesting behavior when you want to control depth however we are still examining other options. But there is more to it than even that. If nothing is selected you can draw a white box. This is just for creating a quick box. With nothing selected it draws white boxes and with a selection it draws a sub box. If you hold ctrl + shift when drawing with nothing selected you will draw a box from the 3d cursor’s position. This behavior is intended for speed so pressing things without being aware can make for a crazy experience. Kinda like opening Zbrush for the first time. While the sub and additive brushes seem awesome the real favorite for me is the slicer. This brush will slice out the mesh into a new section similar to the rebool but with a whole different perspective. Holding ctrl + shift will bring up the slice/rebool box. The same modifier of shifting to alt during still applies for cutting with depth. The way Box Cutter is setup is that you can make quick cuts in quick succession then go in for the kill with finer detail and Hard Ops based workflow. Admittedly this will take some practice but hey this is version 1. As with Hard Ops we plan to make large improvements over time and refine it the level of what we consider “finished”. When it comes to the art of cutting in Blender it goes without saying that guidance edges are as important as ever when it comes to performing booleans successfully. So additionally the option to fast bisect has been mapped to ctrl + D. Pressing it will take you into an edit mode setup where you can quickly click drag and bisect. 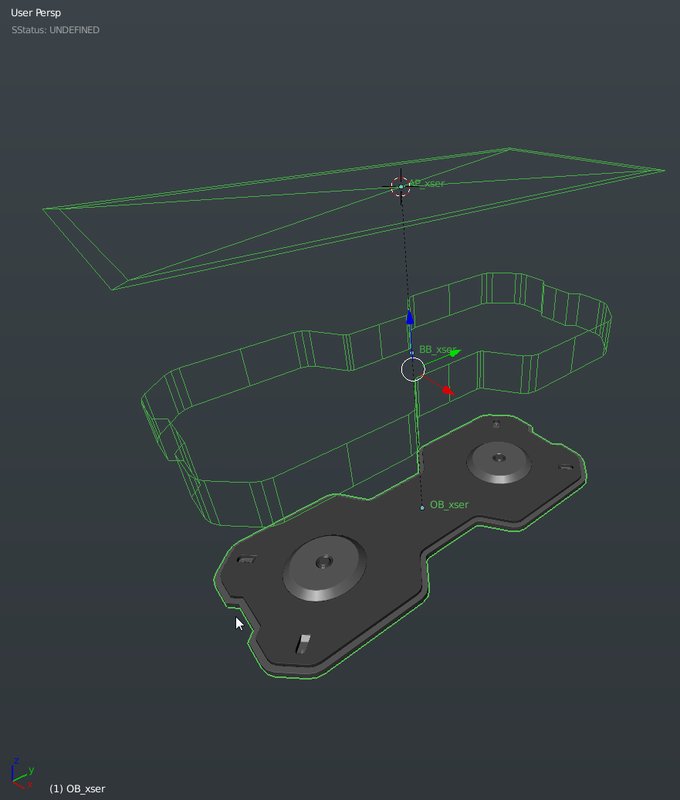 For this basic example it is overkill but in the thick of things this is a very useful tool to ensure your bevels and booleans are working together. Otherwise this method of creation can become a game of luck when eventually you hotline and have to undo. Additional shapes exist with the same behaviors like ngons and circles however they are more experimental at this time. Ngons exist too but they’re my least favorite at this time. And also are the most experimental. You have to click to start which provides no feedback until the 3rd point or so. This behavior I feel will be the hardest to get used to however it is available for those who want to use ngon shapes. We still have much more planned on expansions for this in the future so stay tuned for more information. This wiki is a bit short at this time however a more detailed one will follow. Notes. Esc ends box cutter. End box cutter before closing your scene or opening files. The red border is to let you be aware of box cutter mode. So you don’t accidentally press alt + W twice. When it comes to using Blender I feel that the user experience presented is as important as the tools when it comes to working in 3d for extended periods of time. I always talk about what I call setting yourself up for success, or starting Blender in a way that doesn’t hurt the eyes. While I personally try to keep Blender as vanilla as possible I felt it would be good to make a post discussing my default scene and workflow. When it comes to storing your default scene. Its as simple as ctrl + U in the 3d View. 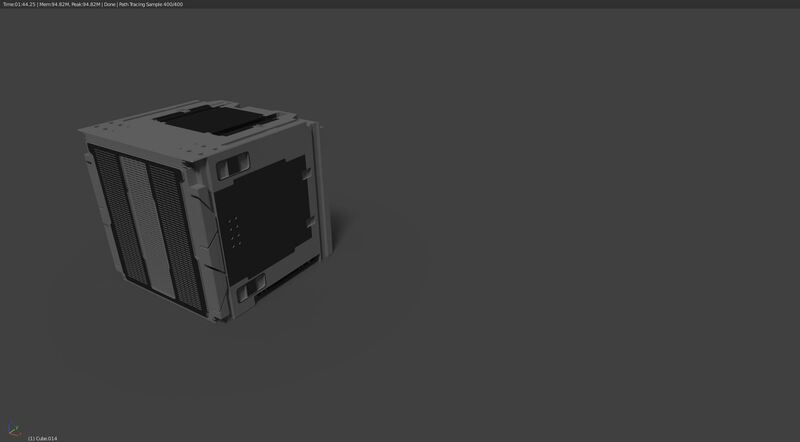 You will get a box confirming the save which will ensure the next time you open Blender it will be exactly like that. This is important since you don’t want to have to deal with mapping every time. The first SFQ to take care of is my theme. I don’t download themes from other places because then I’d have to link them but the defaults that come with Blender suffice. I am also using the one from Steam so your themes may differ. Just go in user preferences and change it. Its refreshing to change it from time to time to something that matches your mood or project. It helps me get into the zone. While you’re in preferences I also enable the plugins I need and set up Cycles to use my GPU under cycles but thats beyond the scope of this post. However I do want to point out some useful things that might be worth pointing out. In the 3d view of user prefs there is an area where you can adjust the size of vertices and outlines. In certain cases where the geo isn’t very dense I like the larger verts. Just something worth checking out sometime if you haven’t. Enabling region overlap allows the T and N panels to be transparent. This is also handy for being able to close and open the panels without interrupting view-port renders plus it looks futuristic! Strangely enough. I also like setting my smooth view up high like 800 so the transitions from the numpad keys are gradual. Also the numpad period focus (.) is also more graceful. These things are cosmetic but it makes Blender feel more tactile to use. Now at this point I also want to discuss quick prefs. This is an add on that you can get here. Once installed and enabled you can use this to change the default viewport shading. Personally I find this to be one of the most essential cosmetic changes I do to Blender. Between the default and the Dark Grey the way the forms are being presented are much different. As strange as it sounds, I feel this improved the quality of my modelling immensely just due to the fact the initial presentation of default shaded meshes might not be the most efficient for someone like me. If your thought is, “Why not matcaps?” Well. Do that. But I prefer the feeling of the Dark Grey. So this is turned on by default and set as my default scene so now we are almost set. The next changes are strictly for those who model with this sort of workflow and may not be efficient or handy for everyone. Select boundary loop is remapped to shift + ` in edit mode. This allows me to make quick selections and then get the border only. Its very quick for panel related things. The other is mapping the mark sharp and clear sharp to alt + and shift + alt +. This is more of a preference however I find it useful in some situations not as many now that Hard Ops exists. I try not to stray from the defaults too bad in case I have to use another PC or my settings are lost. So theres also pie menus you can enable to make life easier but so much additional workflow changes at once can make Blender feel alien. Another thing is on layer 0 of my default scene is a material sphere. It contains materials for the blocking in phases of modelling you often see in my videos. When it comes to texturing I lean more towards PBR in my current work however having some basic materials can make quick modelling session alot easier. I gathered my materials from various sites like Blendswap and the B-wide Node collection. I must also stress that having too much clutter in your default scene will make life harder so don’t go bananas gathering materials and building the hugest set of unusable materials on earth. Find those that work for you. Fine tune them tweak them and make them work for you. Alot of the materials I have I customize a small amount but collecting them is part of the fun. I’m sure everyone has better solutions for this as well however on my end speed is the game so I try to keep it all flowing. I hope this clears up some things about my default scene and helps you to use Blender more efficiently to your needs. If you need more help with fundamentals or getting started, I did a free course! Blending away the pain! In that I go over everything I can from basic modelling / rigging to compositing. It’s just a fun trip around the program! Also the beloved. Blender Basics Recap! In my personal work I am moving into mocap with the Kinnect One and Pro Body 2! If you try it get the Xbox One Kinnect and an adapter not the one for Windows! In this chapter I want to go over something that I was taught recently by a craftier modeller than myself. And that man is Adrian Rutkowski. Vitalii “Fructdw” Vlasov recently pointed me at his gumroad collection of assorted kitbashing elements and after checking them out I was blown away. For that I thank them both for this knowledge keeps my gears moving and knowing that there is always a better way. The alternate ways that artists manage to make the tools work for them versus my ways and habits is always a welcome thing to see. Concept artists in particular are what I call “dangerous”. They enter 3d with a multitude of skills and an artistic eye that can’t be beat with pure 3d studying (or at least for me). I see so many concept guys open the door walk in and immediately begin killing it. I must admit I was nervous when I first saw how finely crafted and modelled each piece was. My first thoughts was that cad software was used and that these parts were not possible to make with precision and care to the edges and normals in Blender. Now before we continue I also want to add. Forget topology for a moment. I know you’re gonna say, “What about UVs?” “What about deformation?” “What about sub-d?”. Lets leave all that alone for a moment and focus on just the shape and the form. In the end that’s what viewers see. Only us 3d folk see the topology and mapping. So if you want to clean up non subdivision parts be my guest but a concepter would craftily figure out a way to make it through the project without the nuances of technical holdup. This is a timelapse demonstrating the techniques discussed in Chapter 6 of “Hard Times and Even Harder Surfaces” which is a patreon exclusive during development. Subscribe for this chapter and upcoming ones over at Patreon! Also I wrote a blog post about freebies in the community worth picking up. All of them have freebies so go check it out! Even I do! So pick up Blending Away The Pain if you haven’t already! 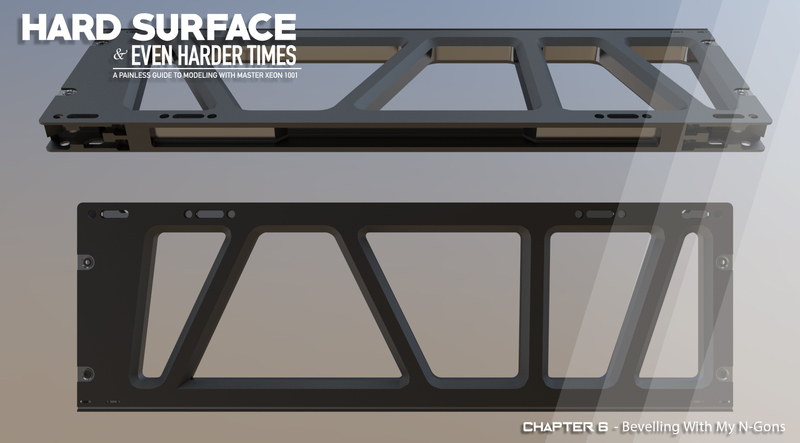 Also I have been working on making finer and finer hard surface assets and if you get the asset collection you can check them out! If you are reading my blog. Allow me to share a patreon exclusive! I have been working on my latest robot. D-29! Enjoy the timelapse P1! In this blog post I wanted to go over custom normals for hard surface creation. I plan on keeping it short but still I find this essential nonetheless. Custom normals exist in most applications and is essential. Maya users are familiar with the process of hardening edges and softening them in addition to locking them down. For this quick post I wanted to discuss ways in Blender to get smooth shading without all the fuss of horrible looking edges or exact tweaking. The first image above shows the mesh on flat shading without any smoothing. While it looks moderately acceptable, for the baking it will show unwanted faceting and make the normal/height show stair stepping that would be undesirable for the final result. When I click set smooth all my problems come to light and show the roughness of my workflow of booling insane amounts of shapes into a planar form. Funny enough. Before custom normals were added I used to fight with this so much and would use the split edges modifier to make life easier. This also increased the vert count substantially and made the mesh denser than the process of making it which was also a bad thing. 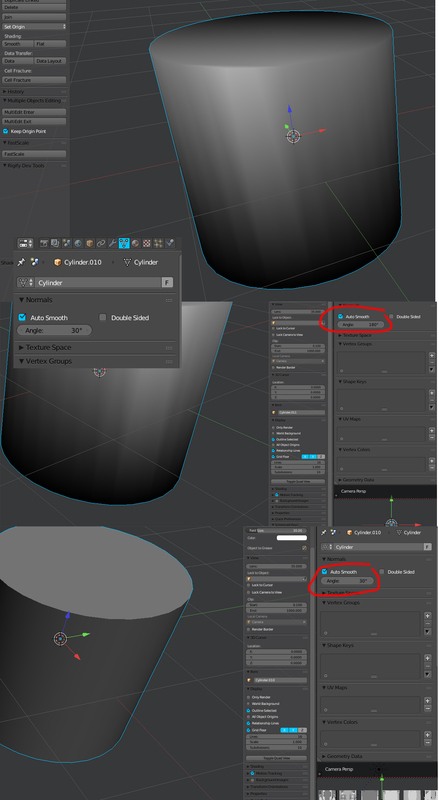 In the object tab there is a normals tab where you can check auto smooth and set an angle as well as turn on double sided (which isn’t needed). The default angle is 180 which isn’t going to show any difference however once you lower it down to either 30 or 60 the normals begin to look much better. The final mesh is now ready to be exported / baked or whatever I plan to. To set manual edges you can press ctrl + e >> mark sharp. This will sharpen the edge similar to how Maya has Normals >> harden edge. I use that as well for shapes I boolean into other shapes and the amazing part is the sharp edges translate well into the subsequent object along with vertex paint, materials and even UVs. But that is all for this tutorial on custom normals. I hope this helps you in your hard surface endeavors. Also be sure to check out my latest tutorial about modelling sci-fi floor pieces using the mesh subtraction kit. I’ll leave you with one more image showing the process on a basic cylinder to help drive the point home. For being cool enough to read my blog I would like to also throw in a free floor! You can check it out and see the custom normal smoothing in action! Thanks again! Also… the default cube of the future.